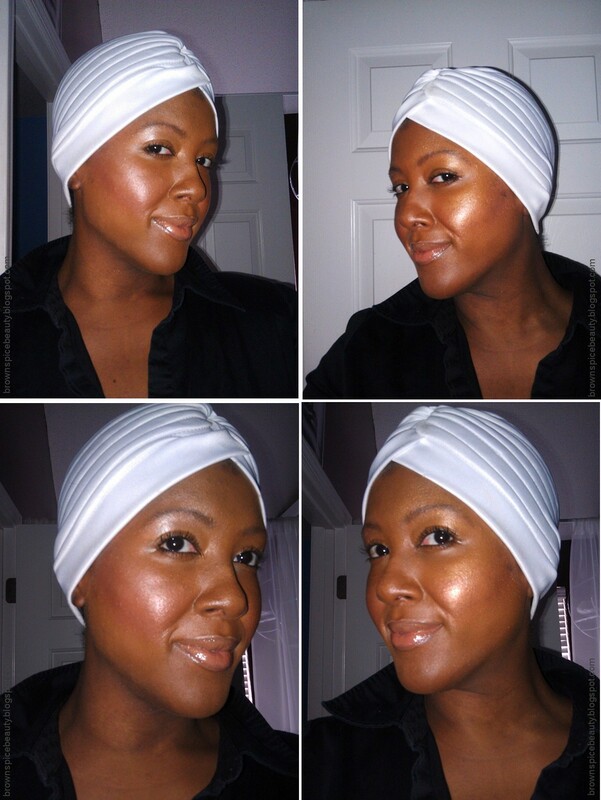 BrownSpiceBeauty: Beauty For Real....Luminize Me! Hello Brown Spice Beauties! Well, I was shopping on Hautelook.com recently and as usually they were have an amazing sale. I came across the Beauty For Real makeup line and thought I would give it a try. They offer mascara. lip gloss, lip pencils, cheek tint and nail polish. I decided to try the Cheek Tint & Luminizer because I have been wanting to try and achieve that dewy, sun kissed, luminous Hollywood glow that so many of my favorite celebrities are seen with. Beauty For Real describes this product as not only used to COLOR and HIGHLIGHT, but it also provides anti-aging benefits. It is never too early for that ladies. They also go on to say their cheek tint contains their new patented ingredient, LUMINERA with a DIAMOND CORE COMPLEX which ensures a smooth, beautiful, flawless finish. How does Luminera work? As Beauty For Real describes: When the transparent particles come into contact with the skin, the DIAMOND CORE COMPLEX transforms invisible UV light and works to DRAMATICALLY DIMINISH the expression of wrinkles, discolorations, imperfections, rendering a more YOUTHFUL, even toned and healthy appearance. Who wouldn't want that? I purchased both Cheek Tint & Luminizer colors they offer. They retail for $29 each , but I got them for $14.50 each on Hautelook.com. The compact was much smaller than I anticipated from the product photos. I love that each compact has a mirror in it with the luminizer color in the top compartment and the cheek tint swings out for the bottom. The tints are very creamy and velvety like the box claims and have a light vanilla smell. Not like a sugary vanilla, but a nice soft vanilla scent. Since it is a creamy product, you want to apply with your fingers or a foundation brush. I used both in my application. I took these pics in the dark so you could see the luminosity of the colors. Believe it or not, this was my first time trying a cream blush. I found both color combinations were Great! I felt like a glowing goddess. The light really bounced off of these colors. It was very easy to apply over my foundation and gave just a hint of color, which I loved, but you can apply more to get a little more color. I also applied the luminizer color under and over by brows in each example. 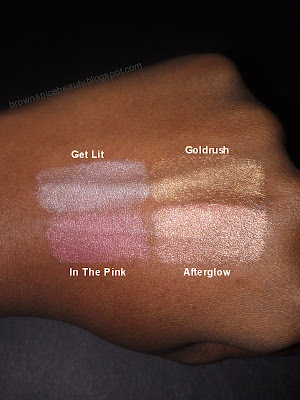 Goldrush/Afterglow gave me more of a glow than Get Lit/In The Pink as most gold tones do on much darker skin tones, but both colors still worked. If you are looking for a deep/heavy cheek color, this is not your product. Consistency: Very creamy and velvety. Easy to apply. Nice Smell. Pigmentation: Light and more natural with a hint of color. Wrinkle Cover Claim: No wrinkles for me to test on. Thank GOD! This is an overall great product. It did all that it claimed, with the exception of the wrinkle cover claim that I could not test. It definitely gave me the glow I was looking for. If you own this product or decide to try it, please leave a comment to let us know what you think.